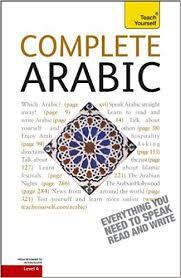 In this article I will review the book Complete Arabic, which belongs to the famous Teach Yourself series. The book can either be purchased separately or in a pack that includes two CDs with audio material. I have used this book to teach a one-on-one course and would recommend it to the beginning learner who can already read whole words in Arabic script. What kind of Arabic? This is probably the first question you should ask when considering an Arabic textbook. The variety emphasized in this book is what I call “informal Standard Arabic”, which is Modern Standard Arabic without many of the case and mood endings that are not found in the modern dialects and that are usually omitted in Standard Arabic in everyday use. This is exactly the type of Arabic I like to focus on in my own teaching. While Complete Arabic teaches Standard Arabic rather than a spoken dialect, you won’t end up sounding like a pedant, a schoolmarm, or a book. The situation with writing is even worse for the absolute beginner. Although some of the exercises require you to write in Arabic, the book does not explain or illustrate how to write the Arabic letters. For these reasons, as much as I like this book, I recommend first learning to read a bit before starting. Working through my own textbook, Bite-Size Arabic: Learn to Read and Write Arabic Using the Tiniest Bit of Vocabulary and Grammar, would be an excellent way to prepare yourself for Complete Arabic. Transliteration. Quite a bit of transliteration is used throughout the book, all the way to the end, which many independent learners will appreciate. While most texts and conversations are presented entirely in Arabic script, vocabulary lists and grammar are presented with transliteration alongside Arabic script. The transliteration system used isn’t pretty, and I particularly dislike the author’s choice to use the ː character (which resembles a colon) to represent the letter ayn (ع ʕayn). While there are several familiar ways of transcribing this sound, the one used here is entirely idiosyncratic and even misleading, given that in the IPA (International Phonetic Alphabet) the ː symbol is used to represent gemination (consonant doubling or vowel lengthening). This is just a personal gripe and should not be taken as a decisive factor in deciding whether or not to use this book. Every book has a slightly different transliteration system, and, in the end, transliteration is only a crutch you will use until you become so well versed in Arabic script that you no longer need it. A nice feature of the transliteration in this book is that it often uses an accent mark to indicate which syllable should be stressed. Few books I’m aware of do that. Content. I like the way the book is laid out. Each unit contains several different texts and dialogues, rather than one monolithic text at the beginning of the lesson. There are many illustrations, making the presentation more interesting and engaging. The grammar is explained in easy-to-understand language, accompanied with easy examples in both Arabic script and transliteration. All this helps make the book appropriate for self-instruction. (It is less obvious whether the book would also be good for use in a classroom setting.) The exercises are varied and not tedious or overly difficult. A wide variety of practical topics and situations are covered, such as meeting people, telling time, talking about your family, giving directions, and Islamic festivals. Several useful items are included at the end of the book, such as an answer key to the exercises, a glossary, and even a summary of the grammar. According to the back cover, this book will get you up to CERF level B2 (which roughly means high intermediate). Coping skills. An aspect that I really like about this book is its emphasis on coping and comprehension skills. There are many exercises where you are given questions in English about a short text. For example, you are presented with a newspaper ad for a job opening. You don’t know all of the words, but can you figure out what some of the requirements for the job are using what you know? The goal is not to understand every word or construction in the text, but to use your current knowledge to extract useful information. These sorts of exercises train you to cope with real-life situations. Summary. This is a great textbook for the beginning learner who has already learned the Arabic alphabet and can read a bit. The material is varied, practical, relevant, and presented in a pleasant way. A special feature of this book is its focus on coping and comprehension skills that will prepare you for actual encounters with Arabic speakers and texts. Previous Want to improve your Arabic on location in Cairo?